The Embassy Theatre was almost full with few seats left, well over 1,000 people in the audience to watch the first nights performance of Andrew Lloyd Webber’s colourful family musical Joseph and his Amazing Technicolor Dream Coat. Joseph and his Amazing Technicolor Dream Coat isn’t your run of the mill stuffy rendition, it’s full of colour and song of all genres, from country to Caribbean. Some are fast paced other slow each depicting the moods of the story beautifully. My favourite songs were all the fast ones which I’m pleased are most of them. I think the Joseph’s brothers had some of the best numbers on the night with the exception of a bizarre French song, which included costumes with onions around the actors necks and even the Eiffel Tower in the background? I didn’t like that one, but the rest of the shows songs where fun, we even got a Rock “n” Roll Elvis number that we all enjoyed. I loved Elvis :-) the best song of the night, so much fun and they included it to my delight several times which was great. The Performance from Craig Charmers was flawless, fun and entertaining, I was very impressed. His acting was good to watch and wasn’t over the top like so many actors in musicals can come across. He was natural and looked as though he was genuinely enjoying every minute of being on stage. The 11 actors who played Josephs brothers was good, they sang well, danced in unison and each had their own character while performing. I was impressed and my hat goes off to Andrew Lloyd Weber and Tim Rice, for incorporating such a variety of songs in the show to fit so many styles into Joseph and still to be able to tell the biblical story Coat of Many Colors in a fun and unique way and I'm even more impressed that this West End show has gone on tour to smaller theatres like the Embassy in Skegness! Usually people whom can not go to London or larger theatres in big cities never get the opportunity to see such a fantastic West End show like Joseph and his Amazing Technicolor Dream Coat and with the Embassy to be packed to the rafters (which I've never seen before) it shows there is a demand by the public in small towns. It wasn’t all roses though for the show at the Embassy, the volume of the amplifiers on the night was too loud in our opinion which made it so you couldn’t hear all the words to the songs at times which was a huge shame and ruined the experience a little :-( We were located in the middle of the theatre, so must have been really loud on the front rows. I’m afraid the lead female singer wasn’t good, her voice at times on the high powerful notes was shrill and actually made me put my fingers in my ears, every time she sang I was on edge waiting for that terrible note to pierce through the air again, add that the amplifiers being too loud and it was awful :-( She doesn’t sing too often and she hits that shrill note only occasionally, so she didn’t ruin the show. All because a singer can hit those piercingly high notes, does not mean they should! She also had the wide eyed cheesy theatre look with the typical over the top toothy grin, the type you could tell she’d been told as a child to wear on stage to try and convince everyone how much fun she’s having. Joseph has a huge cast, the show was the first I’ve seen with so many people on stage all at once. Constantly on stage where a choir of 32 children. I felt sorry for them they where used manly as props on stage (they sat in there position on there steps all night) singing here and there. The poor little things looked so bored and hardly smiled. They had one number to sing on there own only once through the entire performance and not one of them smiled all the way through it, they where so morbid. I was stifling laughter when they where on stage it was a sight to behold I couldn’t find one of them that was smiling. Though my hubby spotted one of the two boys in the choir smiled a little bit. I couldn’t help thinking the show might have been better to have had children’s voices recorded on CD, instead of dragging kids around on tour who wasn’t happy about being there and didn’t real participate in the show (they were living props 90% of the time). It must be so hard on them night after night to go through something your not enjoying :-( If they do enjoy it, they hid it well. 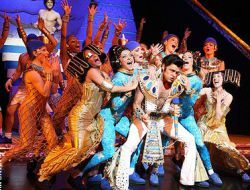 The show is produced well and even though the touring version of Joseph and his Amazing Technicolor Dream Coat isn’t as flashy as the West End production it still was thoroughly enjoyable with great touches that added to the performance. I particularly liked the traveling to Egypt scene in the boat and the talking Pharaoh head prop. Josephs coat of many colours was spectacular and when the coat is extended to fill the whole stage was a stunning moment. I like a show that goes that extra mile putting in little touches of sparkle here a there. The lighting in Joseph for one of the song was a great touch changing in unison alongside the words to the song, so when red or green was sung the stage lights lit the whole stage that particular colour. A very nice detail and something many a production we’ve seen that misses that type of detail which can make the difference between a good production and a great production. Best of all had to be the encore, it was the longest, most entertaining ending I’ve seen in any show, it was a lot of fun and the audience got to clap and join in as all the fast paced songs where sung again. I like to interact with the performance and the ending is what set it apart from other musicals I’ve been to see, which although nice, do lack the fun element when you sit tight in your seat just listening. When an audience gets to participate and feels apart of the performance it’s a wonderful feeling. It’s the one thing that makes the theatre so much fun and unique from a spectator perspective. 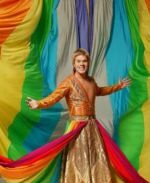 It’s worth watching Joseph just for the ending, even my hubby said the ending was good. I think he would have preferred to have had the whole show like the ending. I gave Joseph a standing ovation and I’m sure you will too. I have been watching the YouTube videos and I noticed the female lead singer/narrator was different from the lady (with dark hair and the piercing voice) that we saw at the Embassy. The lead is listed as a Tara Bethan (blond hair) and that wasn’t her at the Embassy Theatre on the opening night. So she might have been Tara Bethan’s understudy in Skegness? It looks like the choir might have been local kids and don’t travel permanently with the show, If it’s the case these kids are local-ish then the ones at Skegness where miserable on the opening night. TERRIBLE! !